Helps to promote optimizing youthful organ function, thyroid and immune function, energy, clearer thinking, detox, liver cleansing, internal fungal overgrowth, increased sense of well-being, improve skin tone, clarity, anti-aging, texture, pigment and color, the reduction of skin wrinkles and acne facial scars. Methylsulfonylmethane (MSM) in its crystalline MAXIMAL STRENGTH AND ABSORPTION matrix – mineral and organic form vs pills with questioned therapeutic value. This optimal form of MSM is unique, maximal formulation and not readily available. Most researchers say that bio-available sulfur is one of the most important of the trace minerals the body needs and wants. Some research reports suggest about 1% of our entire body weight should be sulfur and it would be a gargantuan task to get this in food. 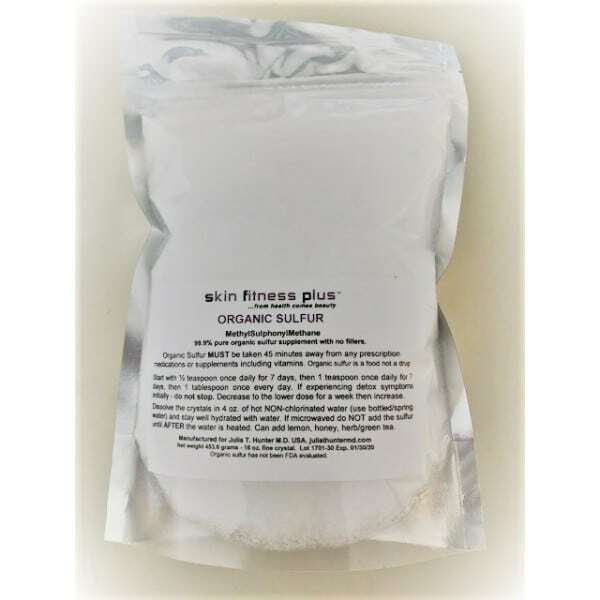 Organic Sulfur – Directions – Follow protocol sheet on how to use and why. This is elemental sulFUR NOT sulFA so the risk of an allergy to this is the risk of being allergic to Vitamin C all of which are present in large amounts naturally in every cell of the body.